The in-state rivals would combine for five goals in the first period alone, as the Sound Tigers jumped out to a 2-0 lead with a pair of goals in a span of 1:54. Scott Howes scored first for the home team, as he stuffed his tenth of the season between the left pad of Whale goaltender Cam Talbot (32 saves) and the goal post at 9:09. Tyler Gron and Justin DiBenedetto were handed out assists on the game’s opening tally. The Sound Tigers doubled their lead at 11:03, when Rhett Rakhshani blistered a shot past Talbot after the Whale failed to clear an initial chance from the zone. Vernace brought the Whale within a marker at the 12:35 mark, registering his first Whale goal with a slapper from the top of the circles beating the SOund Tigers gatekeeper, Kevin Poulin (42 saves). Kelsey Tessier and Scott Tanski earned points with their both assisted on the goal. For Tessier it was his 17th of the season and for Tanski, he notched number five. Connecticut erased their deficit on the power-play at 16:47, after Brendan Bell’s slap-shot from the blue line was tipped by Grant and the puck with eyes, to steal a baseball reference, found its way past Poulin for the equalizer. Grant’s 11th goal of the season was assisted by Bell and Wade Redden. The Sound Tigers sent the game into the second period with a 3-2 lead over their intra-state rivals. After the Whale turned aside an odd-man rush, Steve Oleksy earned his first career AHL goal with 54 seconds remaining, slipping the puck past Talbot. Despite the Whale dominating play and outshooting Bridgeport in the second period, 14-8, and receiving the only two power-play opportunities of the frame, neither team scored in the minutes 21-40. Deveaux scored a huge goal to tie the game for the Whale, and ultimately buy them a standings point at 7:08 of the third period. The Whale forward found the puck in the midst of a scrum in front of Poulin and put it into the back of the cage. The Whale carried a power play into overtime, but were unable to capitalize and found themselves shorthanded after Kris Newbury was whistled for hooking with just 44 seconds remaining in the extra session. It seemed like the game was destined for a shootout, but Donovan’s shot through traffic in front of the Whale net distracted Talbot long enough to put win the game winner into the net with a mere two seconds left. 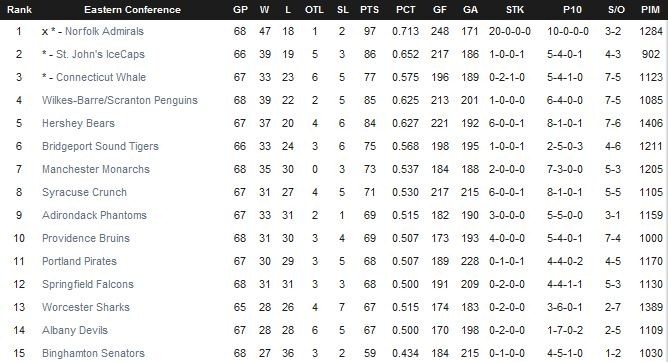 It could have been worse for the Whale, despite losing, the Bridgeport win cut the lead of the Ranger’s AHL affiliate in the Northeast Division to just two points. Bridgeport now also has a game in hand on their upstate rivals. That game will be made up on Tuesday against the Worcester Sharks who lost Sunday 5-1 to the Manchester Monarchs. 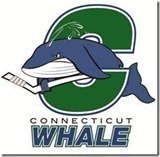 The Whale next return to action Friday (03/30), when they host the Wilkes-Barre/Scranton Penguins at the XL Center (7:00 PM). We’ve said it many times, Mike Fornabaio does one of the best jobs ANYWHERE in covering his team. Here’s his report on Sunday’s game in the CTPost. 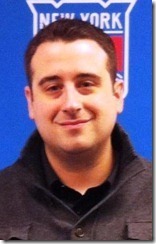 * Steve Zipay of Newsday reports on his Twitter account that the Rangers have stated that Mats Zuccarello will have surgery on his fractured left wrist tomorrow morning. This is NOT the time to be slumping and the Whale are. They will have a week to rediscover whatever it was that they were ding right and correct whatever it is that Ken Gernander and his staff think they need to do to fix it. The Whale will be home on Friday to face the always tough, Wilkes-Barre/Scranton Penguins before facing the Adirondack Phantoms on Saturday and finish out the weekend with a chance to redeem themselves against Providence when the Bruins come to the XL center. Friday and Saturday will have 7pm game times and Sunday is at 3pm. You can hear all the action with Bob Crawford on WCCC.com starting at ten minutes before game time. 1st Period-1, Bridgeport, Howes 10 (Gron, DiBenedetto), 9:09. 2, Bridgeport, Rakhshani 15 (Ness, Landry), 11:03. 3, Connecticut, Vernace 3 (Tessier, Tanski), 12:35. 4, Connecticut, Grant 11 (Bell, Redden), 16:47 (PP). 5, Bridgeport, Oleksy 1 (Donovan, Marcinko), 19:14. Penalties-Vernace Ct (slashing), 12:56; Donovan Bri (hooking), 15:19; Marcinko Bri (holding), 16:59. 2nd Period– No Scoring.Penalties-Oleksy Bri (high-sticking), 6:11; Katic Bri (tripping), 15:59. 3rd Period-6, Connecticut, Deveaux 20 (Valentenko, Newbury), 7:08. Penalties-Wishart Bri (high-sticking), 10:05; Backman Bri (hooking), 19:21. OT Period-7, Bridgeport, Donovan 9 (Katic, Rakhshani), 4:58 (PP). Penalties-Newbury Ct (hooking), 4:06. Shots on Goal-Connecticut 14-14-13-4-45. Bridgeport 16-8-9-3-36. 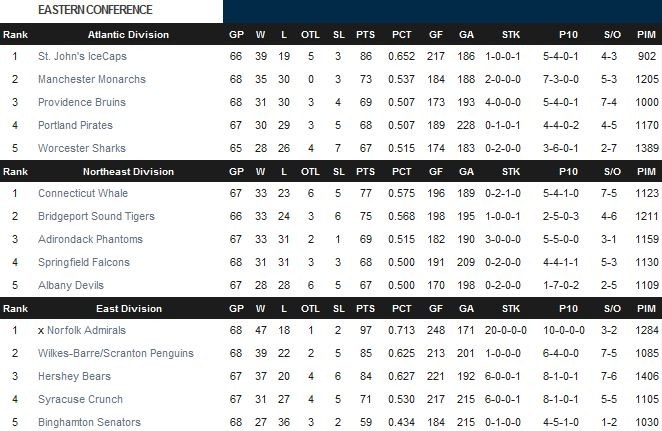 Power Play Opportunities-Connecticut 1 / 6; Bridgeport 1 / 2. Goalies-Connecticut, Talbot 12-13-0 (36 shots-32 saves). Bridgeport, Poulin 18-17-4 (45 shots-42 saves). Linesmen-Luke Galvin (2), Brent Colby (7). This entry was posted in AHL, Connecticut Whalers, CTWhale, Hockey, New York Rangers, NHL, Sports and tagged Andre Deveaux, Bridgeport Sound Tigers, Cam Talbot, Connecticut Whale, CTWhale, Justin DiBenedetto, Ken Gernander, Kris Newbury, Mike Vernace, Tommy Grant, Wade Redden, Webster Bank Arena, Whale. Bookmark the permalink.